This might be a big oops...so here goes the whole thing, pictures and info about 28 days early. Maybe they are afraid of the GT-R hype ? 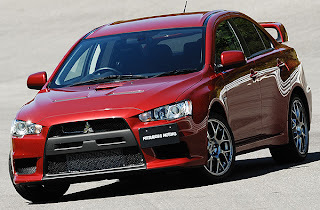 The all-new 2008 Evo X is finally here. Well, almost. You’ll have to wait a few more months for it to hit dealers. But we recently got a sneak peek and first drive of the revamped speed demon at Mitsubishi’s Tokachi proving ground in Northern Japan, and it definitely lives up to the hype. 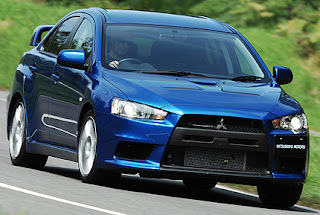 Mitsubishi took a big chance rebuilding this very popular sports sedan, as any serious modifications could cause the vehicle’s core customer—the fast and the furious—to get their speed fix elsewhere. No worries, though; the X (“X” stands for 10th generation) definitely embraces its racing roots. It’s sporty, fast and agile. Even so, this definitely isn’t the same adolescent bad boy that many have come to know and love. The X is more refined, more sophisticated—inside and out. The most notable change is the all-new 2.0-liter intercooled and turbocharged inline Four that replaces the legendary 4G63 engine that served every previous Evo. It’s rated to produce 295 hp (up from 286 ponies) and 300 lb.-ft of torque (up from 289), but many experts believe those numbers are very conservative. To reduce weight, the engine is based on a reinforced aluminum block and is equipped with a direct-acting valvetrain that replaces the roller rocker arm configuration. On the asphalt, the switch translated into quicker throttle response and strong pull, no matter the gear. You’ll have choice of two gearboxes to mate with the new four-banger: a five-speed manual and new six-speed Twin-Clutch Sportronic Shift Transmission (TC-SST). The latter is an electrohydraulic manual transmission that’s not unlike VW’s DSG. It can select two gears at once—one engaged, the other all spooled up and ready to go. When the gears are changed, there is no lag time because the clutches are swapped simultaneously. It delivers quicker shifts than most manuals, but with the smoothness of an automatic. A dynamic handling system, called Super-All Wheel Drive (S-AWC), regulates drive torque at each wheel by controlling a network of handling technologies, such as an active center differential 4WD, active yaw control, active stability control and sport ABS. It takes data input from steering wheel, throttle, wheels and the vehicle’s longitudinal and lateral movements to determine the vehicle’s path of travel, and corrects it when needed. Unlike similar systems from Subaru and BMW, S-AWC let’s you push the car harder for longer before pulling you back from the edge. Instead of simply taking control away from the driver at the first hint of trouble, it places control of the car in your hands while still putting power and torque to the wheels that need it. That’s great for people who can actually drive, and for those who aren’t so good. Mitsu didn’t forget to upgrade the suspension. It provides a more stable ride than the previous model without compromising handling or performance. All Evos sport inverted struts in front and a multi-link configuration in the rear, and are built on a platform that has 56 percent better torsional rigidity and 50 percent better bending rigidity. The MR comes with Bilstein shock absorbers and Eibach springs (rumor has it that Mitsu might also offer this as an option on the GSR, but nothing has been announced officially). Though the GSR setup was tight, it was the MR that really shines in the twisties. In the looks department, the Evo definitely got a major overhaul. The sophisticated design will appeal to those looking for a less edgy, everyday performance sedan—not just a speed racer. The hood has twin air intakes and a NACA duct to provide plenty of oxygen to the turbocharged engine. The front fascia is also optimized to provide the necessary airflow for the radiator and front-mounted intercooler. Mitsubishi calls it a shark-nosed front end, but it looks a bit Volvo-esque to our eyes. In its new guise, the Evo is sure to appeal to more women and guys who want a speedy ride to take out on the town and still be taken seriously.